​corporate event including celebrity events, ​awards ceremonies, private parties, product launches, weddings, film & TV and university balls. Experts in Corporate Entertainment, Event ideas, Act Hire and innovative ideas since 2003. 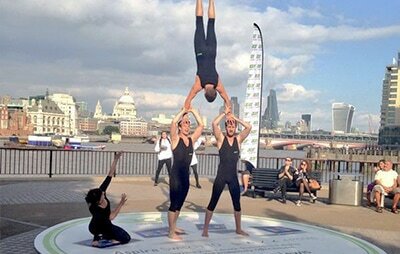 Choose from a selection of ground based acrobatic corporate shows including our unrivalled acrobatic troupe! These shows are a must have for any event organiser looking to make an impact. Each acrobatic act performs exhilarating tricks in different exciting, fast-paced shows! ​Demonstrating skillful balances combined with explosive somersaults, these acrobats have one priority – to entertain your guests. Our group corporate entertainment aerial shows are choreographed to pristine perfection! We have over 10 years experience in creating aerial dance shows for larger venues and arena shows. We offer this entertainment to smaller events too. If you want to add a touch of glamour and sparkle to your event - look no further! 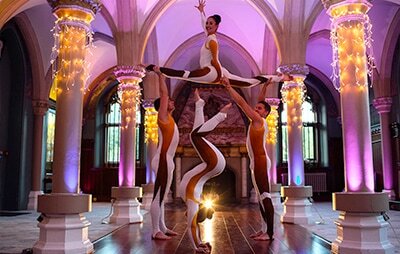 ​Set the pace for your guests with dynamic and explosive acrobats to create the impact you are looking for. 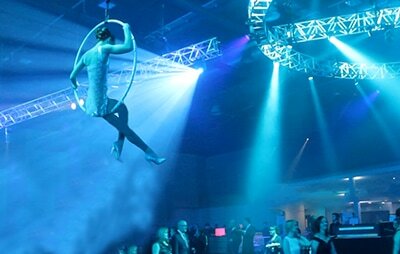 All our aerial corporate performers are highly entertaining and perform dynamic tumble passes, hand to hand and acrobatics. Need to add a touch of excitement to your event? An innovative entertainment idea? These spectacular aerial acrobats perform amazing ambient aerial dancing suspended from the ceiling in aerial hoops and fabric. The sky is the limit - literally! Demonstrating unbelievable flexibility and stunning shapes, this truly is an unique concept for those looking to add something more at the next corporate event. Want something a bit different for your upcoming event? Our freestyle acrobats can provide a touch of excitement and create the impact you are looking for. This is a one stop shop for corporate entertainment, dynamic and explosive freestyle acrobats and free-runners to create the impact you are looking for. An absolute pleasure to work with and extremely professional throughout the planning and performances. Watch their awesome acrobatics on Sky 1 this Christmas. A Spectacular Acrobatic Troupe! The UKCF Acrobats did amazing and you can see them on Cbeebies 'Justin's House', Season 4! Clients literally oo-ed and ahh-ed! UKCF International did a great job and the tricks they performed were unbelievable. 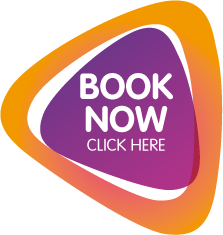 Thanks UKCF for far exceeding my expectations, we look forward to booking you again in the future. What event are you hosting? Choose any combination of Shows listed below. You have read and accept our Terms & Conditions.